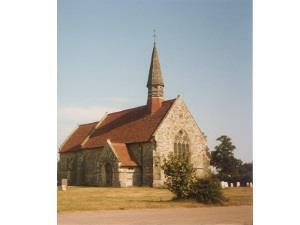 This pretty little church is situated in an elevated position offering extensive views across the Blackwater Estuary. This is an active rural parish church where a number of art exhibitions are staged during the summer months, along with a strawberry fair. Three generations of the Wedgewood Benn family are commemorated here. From A12 (Chelmsford) take A414 to Maldon. B1018 to Latchingdon. By church straight on for Bradwell on Sea. Through Mayland and Steeple. 2km after Steeple, turn right up St Lawrence Hill.